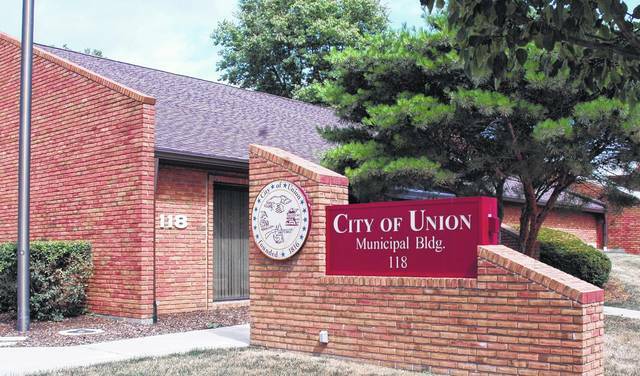 The City of Union Municipal Building is located at 118 N. Main St. Reach the City of Union at (937) 836-8624. UNION — After experiencing ongoing problems with the delivery of unsolicited written materials to residences throughout the City of Union, city council adopted the first of three readings of an ordinance Monday to restrict and spell out how such materials can be delivered. Advertisements contained in plastic bags have been tossed at the bottom of residents’ driveways and sometimes in yards once a week resulting in litter when those materials are not picked up and discarded by property owners. The materials often get run over as people exit their driveways or return home, which sometimes tears the bag open and causes the paper material to be blown and scattered onto neighboring properties or into the street. During rain storms the materials often end up in storm sewers causing them to clog. The ordinance specifies that unsolicited materials must be placed on a porch, if one exists, nearest the front door; or that such materials are securely attached to the front door. If not, the materials must be put through a mail slot on the front door, if one exists, as permitted by the United States Postal Service Domestic Mail Manual, Section 508 Recipient Services, Subsection 3.1.2; or the materials placed between the exterior front door, if one exists and is unlocked, and the interior front door. Where permitted, the materials can be placed in a distribution box located on or adjacent to the premises or securely attached to a hook or within some other receptacle used for the delivery of non-U.S. Mail packages or materials attached to the mailbox post of a premises, if it exists. The materials can also be personally delivered to the owner or occupant, and/or lessee of the premises. The ordinance also provides that a property owner, lessee or occupant has the right to restrict entry to his or her premises. Pursuant to Section 501.11 of the City of Union Municipal Code, it is the intent to impose organizational liability for violation of this section committed by an officer, agent, or employee of a business or organization while acting on behalf of the business or organization and within the scope of the officer’s, employee’s or agent’s office or employment. Materials delivered as a package related to multiple businesses, products, goods, services or messages shall apply to the identified distributor of the package of materials. Council unanimously adopted the first reading of the ordinance.